We welcome you to visit Noble Animal Sanctuary to meet our rescued animal residents. We offer open sanctuary tours several times a year, special events, and private tours. Generally our visiting season is from May- mid November. Volunteers are welcome year round. Please visit our volunteer page for more information. This is a private residence, an appointment must be made before visiting. Please read the guidelines before visiting the sanctuary. Come wander the sanctuary at your leisure during our open sanctuary tours. We have volunteer hosts to show you around, share the animal’s stories, and answer any questions you may have. There are vegan snacks available by donation, and t shirts available for sale. These events are free and open to the public. We appreciate donations to help feed and care for our residents. We hold a variety of private/ ticketed events through the year. Please check our event page for current happenings at the sanctuary. Can’t make an open sanctuary date? Want to meet the animals up close? We are available for private tours May- Oct. Private tours last 1 ½ hours. We can accommodate weekday or weekend tours. Please contact us to schedule. Minimum donation of $20.00 per tour up to 4 adults/children. $5 for each additional member. We welcome school tours, Prosser tour groups, and other groups. Please contact us to schedule your visit. What else to do in Prosser? There are so many events in Prosser, that we could not possibly list them all. 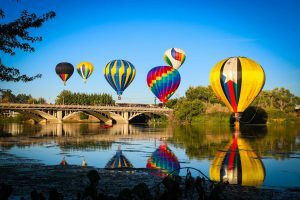 Yearly highlights include Spring Barrel Wine Tasting, Saturday Farmers’ Market, Prosser Hot Air Balloon Rally, Scottish Highland Games, and the Art and Wine Festival. Please visit https://tourprosser.com/ to see the latest events. We strongly recommend wearing comfortable, closed toed shoes for walking about the sanctuary. This is a forever home to many animals. We are not a petting zoo. Our animals are in various stages of healing, some have been abused and are not comfortable with people. We have several free roaming animals around the property. It is imperative that these animals are not chased or grabbed. Do not enter any pens or buildings without permission. Please ask a volunteer before touching an animal. Be courteous, patient, and open minded. No rough housing, screaming, loud noises, or profanity. Please remind children that they are guests in the animal’s home, that the animals need to be treated kindly, not to chase, nor pet any animals without permission from our staff. For the safety of our rescued animals and you, we do not allow any food to be fed to the animals. We know it’s tempting but many of our rescued residents are on special diets, and can be harmed from other foods. For their safety and well-being, please do not feed them anything. We often offer snacks to visitors, please enjoy them near the food serving area. Do not bring and drinks or beverages near the animals. Out of respect for our mission and the values we uphold, we require that any food brought on-site be vegan and free of anything from an animal (flesh, milk, eggs, etc). We are happy to recommend nearby restaurants that have vegan options for after your visit. We love dogs! However, for the safety and well-being of our rescued residents, we are not able to allow dogs on the sanctuary grounds or tours. This includes both companion dogs and service dogs. Our policy is in alignment with the guidelines set forth by the Americans with Disabilities Act. Further, for the safety of all dogs, it is our policy not to allow dogs to remain unattended in cars on our property. Temperatures can quickly rise to dangerous levels inside cars. Further, while we wish we had the staffing and resources to offer to care for your dog while you visit, we are not able to do that at this time. For those needing wheelchair accessibility, the sanctuary is mostly flat for wheelchair or scooter use. If you message us prior to coming we can open the front gate for you to drive into the central sanctuary area. The sanctuary can also arrange for a private driving tour around the sanctuary. Unfortunately, we are not set up with a wheelchair accessible restroom at this time, but do have a restroom. For health and safety reasons, we do not allow smoking anywhere on the property including cigarettes, e-cigarettes, vaporizers, cigars, and pipes. Marijuana is not to be consumed on sanctuary property. Alcohol is only permitted during private wine tasting, or other events where alcohol is available during the event. Illegal drugs are not permitted on sanctuary property.